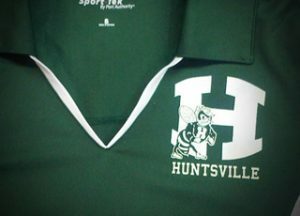 Exclusive to Ink Slingers, this womens polo is the best way to support the hornets & look stylish, all the while meeting the dress code requirements of the school district, and staying cool!Features white piping down the v-neck, both sides of the shirt, as well as a white stripe in the middle of the collar.This polo is constructed of Sport Authority’s Sport-Tek material, so you can be assured that you will the cool as can be out in the Texas heat. The material is designed to pull the moisture off of your skin, and to the service of the polo so it can be evaporated and keep you cool. Most places will try to charge you an outrageous amount for something of this quality, but not us! You can get this v-neck polo in a variety of sizes for just $20.00!